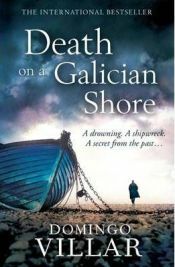 Like so many other crime novels, Death on a Galician Shore opens with the discovery of a body, in this case that of Justo Castelo, a fisherman. His corpse is found washed up near the harbour of the quiet fishing village of Panxon and the death appears to be a simple suicide. However, the results of the victim’s post mortem raise several questions for police inspector Leo Caldas and his assistant, Rafael Estevez, supporting the view of the victim’s sister that Justo Castelo did not kill himself. The investigation leads Caldas to retrace the case of a shipwreck over a decade earlier in which Castelo had been one of three sailors who managed to swim to shore, leaving the boat’s skipper to die, and, as his enquiries progress, he has to find a way to penetrate this highly superstitious and tight knit maritime community. This is the second novel to feature Leo Caldas, and the first I’ve read. I’m a big fan of crime fiction set in countries other than my own but I’ve concentrated recently on Scandinavian authors so I was delighted to find that this setting of Galicia on Spain’s rugged north-west coast re-awakened my interest in the Iberian peninsular. Villar does a great job of imbuing the story with lots of details that reflect the region and its people, without coming across like a brochure produced by the local tourist board. I’ve enjoyed Manuel Vázquez Montalbán’s ‘Pepe Carvalho’ (and the two characters are in many ways similar) series but have sometimes found the gastronomic references gratuitous and out of place but Villar describes just enough to give a flavour of Galicia and make you long for more. A dish of veal and chickpeas served in Caldas’s local bar gets several mentions and it sounded so delicious I was hoped it would crop up to be savoured again. In the course of his investigation Caldas must contend with the unique personality of his Galician brothers; Galicians are said to be people of few words who find it difficult to give a definitive answer. It’s a trait that Estevez, an immigrant in Galicia, finds difficult to work with but it works brilliantly in crime fiction because it always leave that seed of doubt in your mind. The translation is excellent and Sonia Soto has managed to capture the traits of the Galician temperament without any awkwardness. The plot is complex, though not untidily so nor complicated, but the mechanics are intelligent and enhanced by this inability of the witnesses to make a concrete contribution to the investigation. The relationship between Caldas and Estavez, coloured by the Galician’s frequent ambivalence and the outsider’s hot-headedness makes for compelling and, at times, comical reading. Caldas’s back story is engaging: in this novel his father is pre-occupied with concerns about his brother, Alberto, terminally ill in a Vigo hospital and Leo’s difficulties in finding time to visit while carrying out the investigation appear to be a bone of contention where his father is concerned. His father keeps a “Book of Idiots” in which he writes the names of people he considers foolish and there are signs that he may even add the name of his own son, whose foolishness over a woman he finds difficult to understand. Through the course of the story we learn more about this woman, Alba, and it looks set to be a thread that could be picked up in future. Though hardly original, the character development, at least as far as Caldas is concerned, is nevertheless handled well. The character that really pricked my interest was Estevez and I’d love to see some flesh added to those bones. The lively pace is maintained through short chapters but this means that it’s not possible to engage with the main characters as much as I’d have liked. Perhaps if I had come from the previous episode, Water-blue Eyes I’d not have that reservation although the third person narration does have an air of remoteness from the key players. From what I hear this novel does contain spoilers so its predecessor should be read first, ideally. Cleverly constructed and exploiting location supremely, Death on a Galician Shore is a brilliant police procedural that kept me guessing right until the end. Villar’s portrait of Galicia and the Galician people is colourful and evocative without being overly poetic, while the intricate plot is meaty and exciting. The dialogue is superb and Villar plays on the unique nature of the Galicians without resorting to caricature. A super read, and one that left me greedily wanting more. With thanks to Little, Brown Book Group for sending us a review copy. No Comments on "Death on a Galician Shore"